A Stack for your documents. A Stack for files you download, such as saved Mail attachments, file transfers through iChat, and files captured from the Internet with the Safari browser. Icons for the files, along with their names, fan out in an arc. The most recent file is at the bottom of the fan. Files and names appear as a grid. By default, the fan or grid decision is determined automatically by the number of files in a Stack. So while the fan view is more attractive, a grid lets you peek at many more icons at once. However, both views have their storage limits. You can’t display, for example, hundreds of documents in a grid or a fan. So you’ll see an icon that says 598 More in Finder or whatever the actual sum is. 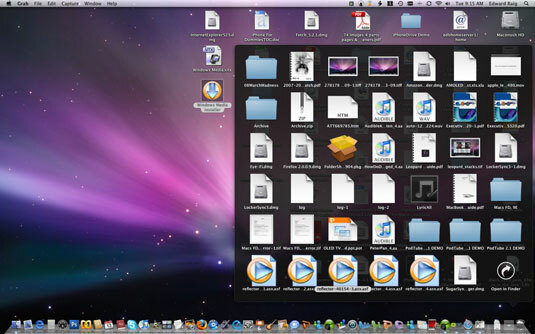 Clicking the More in Finder icon takes you to the Finder. You can dictate whether Stacks spring out as a fan or grid. 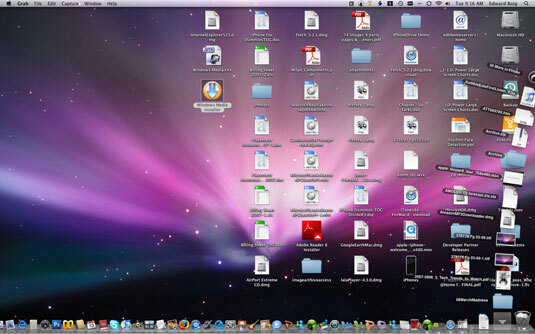 Right-click, or Control-click the Stacks icon in the Dock to instantly bring up the Stack’s contextual menu. Or hold down the left mouse button for just a second until the menu appears. From the menu, choose Fan, Grid, List, or Automatic. You can also sort the Stacks icons by name, date added, date modified, date created, or kind of file.